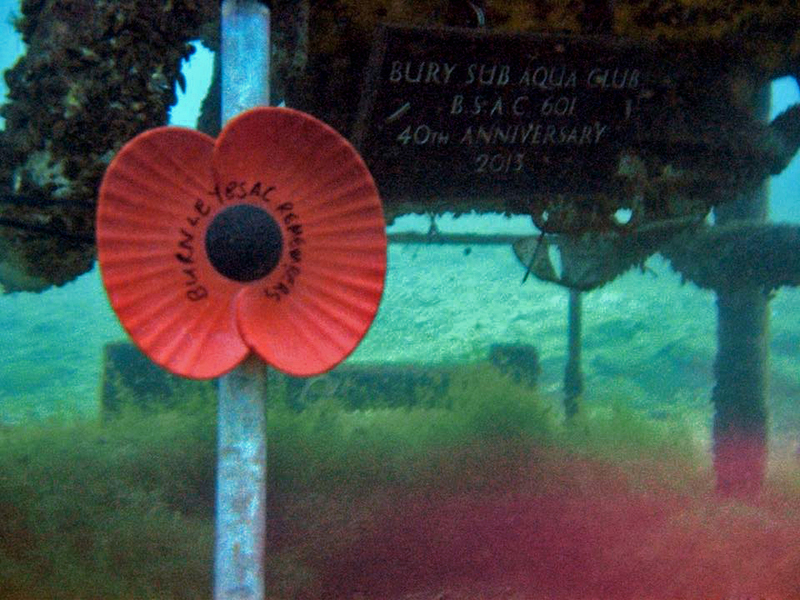 Burnley Sub Aqua Club commemorated the WW1 Armistice Centenary by attaching a poppy to the bottom of the Diving Bell at Capernwray on Sunday 11th August 2018. 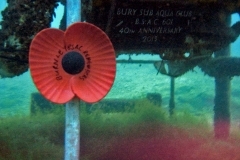 Club members held a 2-minute silence as a mark of respect, at the Diving Bell. Thank you to Naz Alam for sourcing the poppy, James Dennet for attaching the poppy to the Diving Bell, Simon Fryer for taking the picture and Martin Williams for posing! Nads was there too, just no photo’s with the poppy! The quest to find a suitable poppy wasn’t as straight forward as it was in previous years. It seems that there has been a massive increase in local Town Councils using the larger event poppies (about 20″ across) to decorate their towns by attaching them to lamp posts. Try as we might, we could not get hold of the large event poppy. Even the Royal British Legion poppy sellers were completely sold out … so we had to make do with a car poppy (about 8″ across). On Wed 7th Nov, Naz was running around multiple towns to find suitable poppy and completely failed to find an event sized poppy, but a lot of good came out of searching. For those that don’t already know, Naz runs some local community groups (Colne Talk Facebook group, 18K+ members & the Visit Colne page) and often promotes the local community, events & local life. On his way to one of the popup Poppy shops recommended by the local community, he briefly stopped off at West Street School, Colne to take a picture of the Remembrance display on the school railings (cameras are always in tow) . As luck would have it, children from the school were just being taken to Colne Cemetery to place wreaths & crosses that they had made on all the local War Graves. So, the West Street School Remembers story was published. A little while later, the lovely ladies at the Earby Poppy Shop explained why there was no chance of buying an event sized poppy before the 11th & chatted to him for a couple of hours about WW1 – the Earby Poppy Shop story was the result! These stories brought extra spin-off work: Blacko Primary School, St. Bartholomew’s Church, St. Michael’s Church (Foulridge), Colne Cemetery, ‘Whalley Remembers’ event and, of course, the ‘Remembrance in Colne’ event … that accounts for Fri-Sun! Not all the stories have been published at the time of writing, but you will eventually be able to see them at http://www.colnetalk.co.uk/tag/remembrance/. 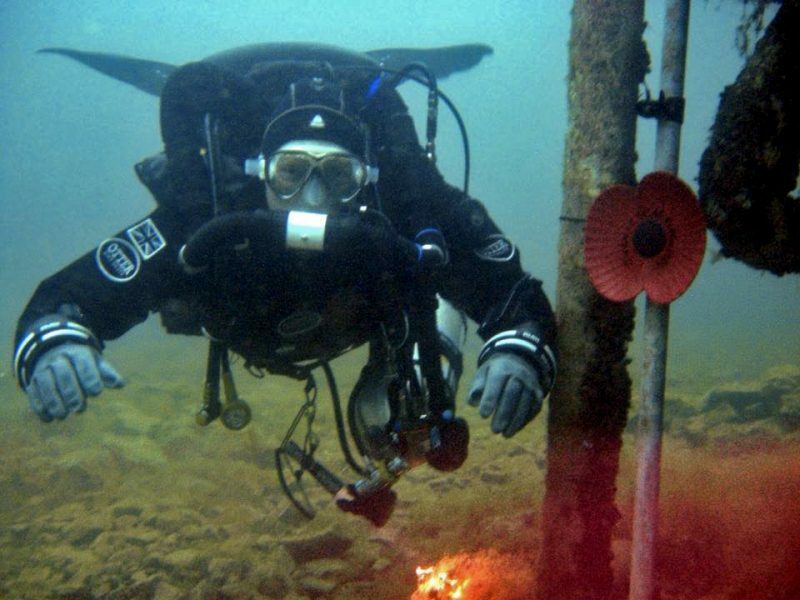 Unsurprisingly, Naz was intending to attend the Centenary Event in Colne (his local community work) – so he reluctantly declined the invites to our Remembrance Dive. This caused us a little problem in that he’s usually the one armed with a camera and Simon’s Go-Pro had just completely died. Luckily, Simon found his spare camera rig and somehow got it to work – the last we heard, it had been flooded and was also on the scrap heap! The poppy was handed over to James on the evening of Sat 10th 2018, during a curry night at James’s new house. 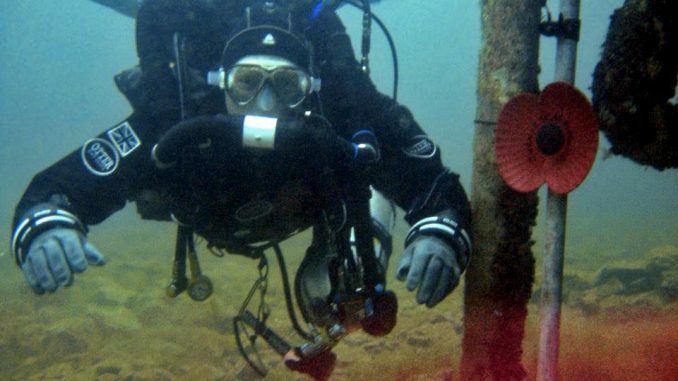 The Remembrance Dive was already planned for the next day, Sun 11th November 2018. 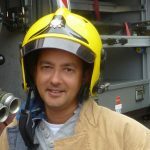 Simon was also due to deliver Day #2 of AP Inspiration CCR re-breather training (MOD1) to Nads & Martin on the same day, so the two activities were merged.